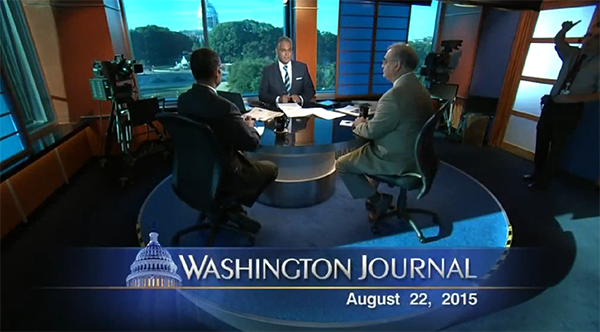 Two threads of the national immigration debate came together Saturday morning on C-SPAN's "Washington Journal" program. First, as one caller demonstrated, many black Americans are upset at the federal government's failure to keep illegal immigrants from getting jobs. Second, as Center for Immigration Studies Executive Director Mark Krikorian observed as a guest on the program, the political alignment of immigration policy is best seen as a matter of top/down rather than left/right alignments. Elites favor expansive immigration and lax enforcement, said Krikorian, while working people want less immigration and more enforcement of immigration laws intended to protect American workers. The caller identified herself as a black woman who was "livid" about illegal immigrants in the workplace. "If we would fine employers a million dollars for each illegal, or person who should not be [working], it would be taken care of," she said. "We just don't have the will. And we don't care enough about American workers. Here in the black community, you have our young people from age 16 to 24, 50 percent unemployment. How are you going to bring in other people and you ain't even satisfied with American people?" Otis Graham, a historian and one of the founders of the Center for Immigration Studies, noted the silence of many black leaders about this problem. In his 2006 book Unguarded Gates: A History of America's Immigration Crisis, Graham wrote that, in the 1970s, "black political leadership was persuaded by Hispanics to shun the immigration issue in order to hold 'the civil rights coalition' together." But there have been some black leaders who have taken a stand on behalf of American workers. Most prominent among them was Barbara Jordan, a former congresswoman and civil rights icon, who during the Clinton administration directed the U.S. Commission on Immigration Reform. Said Jordan: "Credibility in immigration policy can be summed up in one sentence: Those who should get in, get in; those who should be kept out, are kept out; and those who should not be here will be required to leave."